The TMJ, or temporomandibular joint, is one of the most active joints in the body. This means that any dysfunction to one or more areas of the joint could lead to various disorders. 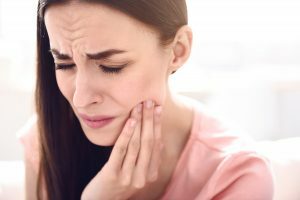 Approximately 10 million Americans or more have TMJ disorder (or TMJD), with women being more prominently affected. The temporomandibular joints are located on each side of the face, connecting the lower part of the jaw to the head. The muscles connected to and surrounding the jaw make it possible for its many directions of movement. The combined ability to hinge open and close and also to be able to slide left and right (for example, while chewing) is why the TMJ is unique from every other joint in the body. The jaw muscles that control it may be working incorrectly. It’s possible that there is an issue within the joint, involving either the disc or with the way that the two connecting bones are interacting together. Arthritis might be affecting the TMJ, leading to degeneration and inflammation. The location of the temporomandibular joints plays a big part in why these signs are connected to TMJ disorder. The joints are situated extremely close to the ear and the uppermost vertebra in your spine, the atlas. This can help you understand why symptoms like neck pain, earaches, and headaches would happen simultaneously with TMJ dysfunction. There are multiple, conservative treatment options for TMJ disorders. Usually, these alterative options are recommended by a dentist or other healthcare professional trained in TMJD. The bones – when the atlas is out of alignment, it can interfere with the proper resting position of the jaw. As time goes on, this can cause pain, discomfort, popping, clicking, locking and other TMJD symptoms. The muscles – atlas misalignments can lead to unequal muscle tension on the left and right sides of the face. More (or less) pulling to one side versus the other can have impacts on the way that the jaw functions and cause abnormal movements. The nerves – the nerves connected to the jaw joint and the muscles, originally branch off of the brainstem to connect to the jaw. The atlas encloses the brainstem protectively within it, so when this vertebra misaligns, it can cause irritation to these nerves. When nerves are unable to send and receive signals efficiently, it can lead to TMJ dysfunction. Rickards Chiropractic is an upper cervical chiropractic practice, which means we focus closely on the details of atlas alignment. If you come in for a complimentary consultation, we can share more on how your TMJ and other related pain could be connected to the upper cervical spine and the factors previously discussed. Even a misalignment of 1/4 millimeter can take a toll on the body, which is why our gentle and precise adjustments can bring impressive relief to our patients. Upper cervical chiropractic care is different from other chiropractic care since our adjustments are uniquely tailored to each individual’s needs. Atlas misalignments can happen in a variety of directions and severity, so each adjustment must be tailored to the patient’s condition. This kind of customization makes it possible for us to restore normal alignment that holds in place for longer, giving the body more time to heal around the correction. If you’d like to hear more about upper cervical chiropractic care and whether it is the right solution for your TMJ disorder, come in for a no-obligation consultation as a first step to increasing your quality of life.